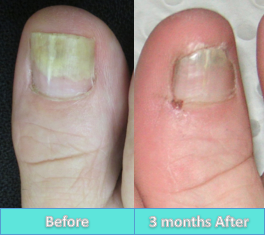 Fungal Nail Laser treatment provides a fast and effective solution for onychomycosis, with no downtime and no adverse side-effects. Our Specialist Dr Knox was one of the first in Western Australia to start performing laser treatment in 2014, and has had many patients benefit from the new technique to date. Fungal nail laser treatment is now advertised by many Perth Podiatry practices, however the large majority use class 3B lasers which do not produces enough heat and power to eradicate the infection. 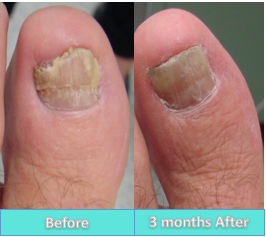 At Perth Podiatric Surgery, we use the strongest medical grade laser commercially (Class 4 – Nd:YAG laser) to pass light into the infected nail and kill the nail fungus. We also have a cooling unit available which helps to offset any unwanted heat generated from the laser, and provide patients with a care-free experience. The fungal nail laser treatment takes between 15 minutes to half an hour to perform and generally requires between 1-3 sessions depending on the pattern of infection present, thickness of the nail, and duration of infection. This is at the discretion of our Specialist, and is discussed with patients at their initial assessment on a case-to-case basis. In most instances however we recommend up to 3 sessions are performed, with each session spaced one month apart. We have observed routinely satisfactory clearance of the infection in patients having this treatment after 6-9 months, and no associated complications. The total cost is $300.00 per session, which is partly-rebatable via Private Health Insurance.